VISIT THE WEBSITE FOR THE NEW FILM! Enquiries about the film? Send us an email! "The latest in the 5 Animals series, with an introduction by Rob Laidlaw, 5 Giraffes profiles five unique giraffes from both captivity and the wild. Accompanying the five giraffe profiles is information on their diet, social life, and chapters on some of their more unique aspects, like the giraffe's unusual body. " "In the 1950s, Anne Innis Dagg was a young zoologist with a lifelong love of giraffe and a dream to study them in Africa. Based on extensive journals and letters home, Pursuing Giraffe vividly chronicles the realization of that dream and the year that she spent studying and documenting giraffe behaviour." "When Anne Innis saw her first giraffe at the age of three, she was smitten. She knew she had to learn more about this marvelous animal. Twenty years later, now a trained zoologist, she set off alone to Africa to study the behaviour of giraffe in the wild. Subsequently, Jane Goodall and Dian Fossey would be driven by a similar devotion to study the behaviour of wild apes. In Smitten by Giraffe, the noted feminist reflects on her scientific work as well as the leading role she has played in numerous activist campaigns." Dr. Anne Innis Dagg saw her first giraffe while visiting our very own Brookfield Zoo as a toddler, which is where her fascination with the species first began. Her enchantment with giraffe continued to grow as she matured, and at a young age she made it her life's goal to study giraffe in Africa. Anne received a Bachelor of Arts in honours biology and a Master of Arts in genetics from the University of Toronto. Anne continued to look for ways to fulfill her dream of traveling to Africa to study giraffes but received very little encouragement from peers and professors at the University. Through a friend, Anne contacted a farmer in South Africa using only her initials so she would not be discriminated against because of her gender. The farmer agreed to allow her to stay in the farm-hand quarters and off to Africa she went. On the farm she studied the ecology and behaviour of 95 giraffes over a 6 month period. Continuing to face gender discrimination after returning home to Canada, Anne spent the next decade forging ahead and compiling her data to present in her books and other publications. In the fall of 1967 she completed a Doctoral program studying animal behaviour at the University of Waterloo. After receiving her PhD, she found it difficult to find a job, as universities in the 1960's did not often hire women. Instead Anne worked as an independent researcher making many groundbreaking discoveries about wild giraffe and other species. 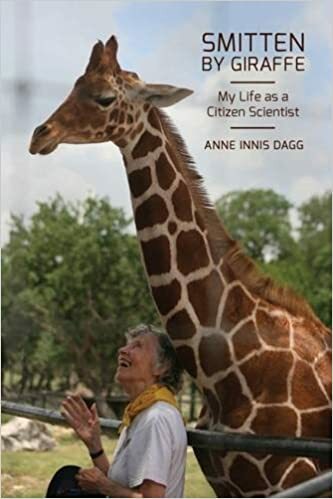 Anne has authored 20 books along with countless trailblazing scientific papers and is the inspiration for many of the researchers and giraffe care professionals joining us for this conference. We are happy to have Dr. Anne Innis Dagg here with us at the International Giraffe Conference 2016. Anne attended the 2016 Giraffid Conference in Chicago in May along with 160 other people interested in giraffe, mainly giraffe researchers and giraffe keepers in zoos around the world. She was excited to be at Brookfield Zoo because it was here, in 1936, that she saw her first giraffe and became enamoured of them when she was three years old. Since then she has become a scientist who has written numerous scientific papers and five books about giraffe. At the conference she was honoured with the “Dr. Anne Innis Dagg Excellence in Giraffe Science Award”; this award will be presented at each conference in the future to an individual who has done stellar work with giraffe; this year it was Dr Zoe Muller from Great Britain and the Rothschild’s Giraffe Project in Soysambu, Kenya. "Anne Innis Dagg: Canadian giraffe researcher was a scientific pioneer"
"At the age of 23, Anne Innis was the first person to study African wildlife in its natural habitat. She blazed a trail that was distinctly Canadian, like her father, the political economist, Harold Innis. Sandy Bourque's documentary, told through Anne's eyes, is the story of one woman's courage and determination to study wild giraffe in South Africa in the 1950s. She offers a provocative witness to the terrible ease and disturbing normality of what would later come to be known as apartheid." Professor Anne Innis Dagg of Waterloo’s Independent Studies program was the guest of honour at the first birthday party for a pair of rare twin reticulated giraffes, Wasswa and Nakato, born at the Natural Bridge Wildlife Ranch near San Antonio Texas. on Anne's book "Animal Friendships"
"In a new book, Animal Friendships, published by Cambridge University Press, Dagg shows how animals benefit from friendship. They share food, alert one another to danger, support each other in conflict, share information, improve the other's status and reduce emotional distress. Sounds a bit like humans, doesn't it, she says." Anne was a central figure in the Independent Studies program at the University of Waterloo since 1978. It was an amazing program in which highly motivated students designed and pursued their own curriculum. Closed by the Univerity of Waterloo in 2016 after 40 years of operation, its principles are being adopted by a new wave of cutting edge educators.